Noel, what did Premiere do with their movies? Can you tell us more about it? While on the subject of movie productions, let's take a look back at Nora and the movie productions that helped her throughout her career. Sampaguita Pictures was the movie production outfit that discovered Nora Aunor. She started in movies of Susan Roces, Amalia Fuentes and later on Rosemarie Sonora and Ricky Belmonte. Her first starring role was under Tower Productions in D'Musical Teenage Idols. This cause a dispute between Tower and Sampaguita. The two companies were fighting over Nora's services. I don't remember how it was resolved but Nora made many movies at Tower with Manny de Leon and at Sampaguita with Tirso Cruz III. Premeire Productions took her to USA to make Lollipops and Roses with Victor Laurel. Premeire also produced for her Fe, Esperanza, Caridad, a trilogy movie that was directed by National Artists Gerry de Leon and Lamberto Avellana. The same outfit gave her Minsa'y Isang Gamu-gamo and Magandang Gabi sa Inyong Lahat with Lupita Concio-Aquino Kashiwahara as director. Tower Productions also made The Singing Filipina in the US pairing her with Sajid Khan and The Golden Voice and Nora Around Asia with Manny de Leon in a cruise ship touring Asia. Majority of her movies at Tower are the forgettable type. Sampaguita took her to Sapporo Japan to make Winter Holiday and My Blue Hawaii, where else, in Hawaii. Tagalong Ilang-Ilang Productions (Vilma's home studio back then) gave us Nora-Vilma and Christopher in Ikaw ay Akin by Bernal. Joseph Estrada's JE Productions made Erap is my Guy and Bakya Mo Neneng. Dolphy's RVQ Production made three Nora-Dolphy movies: Kaming Matatapang ang Apog, Jack and Jill of the Third Kind and My Bugoy goes to Congress. Lea Productions paired her with Walter Navarro in Somewhere Over the Rainbow, and Chrisopher de Leon in Relaks Lang Mama Sagot Kita and Kung Ako'y Iiwanan Mo directed by Laurice Guillen. Ian Films is another production company that produced serious movies for her like Eddie Garcia's Atsay and Mario O'Hara's Bakit Bughaw ang Langit?. Regal Films gave us Nora and Lito Lapid in Kastilyong Buhangin, and brought back the Guy and Pip loveteam in the '80s with Bilangin ang Bituin sa Langit, Can't Stop Loving You and many more including the one that feature the love triangle of Nora-Christopher-Tirso Cruz III in Mahal Mo, Mahal Ko. A lot of new production companies took Nora's services for their initial offering. The outfit that made 'Merika (filmed in New York) and Bulaklak sa City Jail were new producers and never made another movie since then. Viva Films gave us the Nora Aunor of the 90's: The Flor Contemplacion Story, Muling Umawit ang Puso and Bakit May Kahapon Pa. I'm sure I miss other movie outfits but these are the prominent ones. With all the money that Nora made for some of this companies, it is sad to think than when Nora Aunor was down and out, none of them except maybe for Premeire Productions (they produced Babae) gave Nora another project. Then, again, a lot of them are not active anymore. If I remember right, VM or Villamayor Productions did Tatlong Taong Walang Diyos. Premiere didn't take care of its prints. Most of them are gone now--torotots, or just melting vinegar. That is sad about Premeire. It was one of the Big Three companies (LVN, SAMPAGUITA AND PREMIERE) in the old days, wasn't it? Sorry, NV productions nga (that looked wrong when I typed it). I read the script they were going to do together--La Loba Negra. It's incredible--Noli Me Tangere done as a horror epic. Pinoy, you forgot Gaano Ko Ikaw Kamahal, 1982, O'Hara's follow up to Kastilyong Buhangin. It's a period film, and he says it's much better than Kastilyo. Notice that list--how many of Nora's best work is in it? They're all terrific work--Condemned is about as perfect a noir thriller as was ever made (the best Filipino serial killer film ever made too); Bulaklak is the best work Lualhati Bautista ever did, wonderful ensemble cast, yet Nora still stood out; Kastilyo is pure melodrama, yet Nora and Lito are incredibly good in it (it's the film that established Lito as a romantic lead). Even Tatlong Ina, Isang Anak has serious flaws, but Nora does some good understated comedy in it. Tatlong Taong Walang Diyos was supposed to be Lino Brocka's project, only he, and I quote, didn't want "anything to do with that Superstar!" O'Hara was one of the few who refused to judge her and use her in a movie; the result is one of her greatest performances (THE greatest, in my opinion), and one of the greatest performances in all of Philippine cinema. Didn't Premiere stage a brief and unsucessfull comeback and was re-launched as Premiere Entertainment Productions? I remember they had an afternoon TV show on RPN 9 where they showed their old movies. I'm posting a portion of an article from Alfie Lorenzo re: Nora - Vilma rivalry in the '70's. Click the link to read the rest of the article. Now, ang pinakamagandang nangyari at nagawa ng pagsulpot ng Nora-Vilma rivalry ay ang pagka-divert ng atensyon ng moviegoers from patronizing bomba films at ang panonood ng mga pelikula nina Nora at Vilma na noong mga panahong iyun ay binansagang BAKYA. Pero movies especially ni Nora Aunor ang nakipagkumpetensya at tumalo sa bomba films, huh! Kaya natawag ang pansin ng dalawang top action na sina Fernando Poe Jr. at Joseph Estrada ng dalawang bulilit na lumalaban sa bomba films na hindi nagawang sabakan ng mga higanteng action stars. 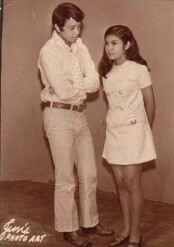 Pinagtig-isahan nina FPJ at Erap ang dalawang dekada &#8216;70 stars, si Vilma Santos ay napareha kay Fernando Poe Jr. at si Nora Aunor ay na-identify until his presidency sa nag-iisang Superstar ng bansa. Nakapareha rin ni Erap si Vilma sa pelikulang tipong King and I at si Nora ay napareha rin kay FPJ , pero higit na tinangkilik ng madla ang tambalang Nora-Erap at Vilma-FPJ. Here's the link for the complete article. Noel thanks for the info. I based the list from your article about Mario posted at the UP Film Center website. By the way, is it okey if I post more of your articles at my Nora website? I'll put a link to your movie review newsletter so people can sign up or let me know the publications you write for so we can mention it. Absolutely pm. But if I ever get a chance to see Bakit Bughaw ng Langit (got a tape? ), can we replace the one you have there? It has a few comments that really set my teeth on the edge. I THINK it's in your website. Isagani Cruz, or Mario Hernando or someone. I'm sorry, I don't have a tape of Bakit Bughaw ang Langit. I'm trying to find one too. What's wrong with the Isagani Cruz' review? The review starts with this. There's no doubt about it: Mario O'Hara is a major director. In Bakit Bughaw ang Langit?, he tackles the same basic situation Lino Brocka deals with in Bona. In the comparison Brocka suffers. Where Bona fails, Bakit Bughaw ang Langit? succeeds. High praise for Mario O'Hara; what more could you want. Of course, it's always good to have other opinions. Unfortunately, the only book of movie reviews that I could find are Movie Times by Isagani Cruz and The National Pastime by Joel David. Anyone else that have movie reviews of Nora Aunor movies, good or bad, I'd like to have a copy please. I read that BONA was also reviewed by Variety in 1981. I wish I could get a copy of that. By the way click here for the rest of the Bakit Bughaw ang Langit? article. Well, I think he goes on (sorry, didn't click the article but I think it's there) to complain that when someone says "Bakit bughaw ang langit?" the camera pans up and the sky is grey. Kind of besides the point. And yes, it had praise, but it didn't go into much depth into the film, I think. "It co-stars Christopher de Leon who plays a Japanese soldier"
That I consider the greatest Filipino film ever made, and Nora's performance one of the finest ever by an actress, period. starring: Nora Aunor, Christopher de Leon, Rafael 'Bembol' Roco, Jr.
One of the rare films from a country that has tasted Japanese wartime atrocities where the Japanese are not portrayed as out and out monsters. The hate is prevalent even now. See movies like Raise the Red Sorghum, Farewell to My Concubine, and even Rising Sun. There is a Thai film...but Thailand wasn't invaded by the Japanese. Likewise, there is a Chinese film The Devil in the Doorstep, but it was only made recently, in the 1990s. Tatlong Taong Walang Diyos is arguably the first, and for the longest time the only one in this admittedly narrow category. Skycable's version of Tatlong Taong is actually clearer than the one existing print. But there are a few cuts. It's still largely whole, though. And still a great film. Yes, I caught it on Cinema One. Someone sent me this picture but before I add this to the website, I'd like to identify the guy with Nora. Can anyone help me with this please? Also, I've posted the reviews of Bakit May Pag-ibig Pa? and Dalaga si Misis, Binata si Mister. Bakit May Pag-ibig pa is a two episode movie by two directors: one by Bernal and the other by Celso Ad Castillo. The second movie is by Lino Brocka. According to my prof., the Premiere film lot in Kalookan was hit by a massive fire that razed it to the ground. Rumor has it, it was the unhappy employees of Premiere themselves (there was an ongoing labor unrest) who set the place on fire. So, maybe, they lost most of their films as well. Tatlong taong will most likely be seen again on Cinema One. On Christmas, or Independence Day, or Holy Week. Like I said, buy the Skyguide, or download from the website. Watch the skeds. Premiere wasn't paying its employees so they took home or destroyed many of the prints. I heard that story. Noel, you do realize, that your lifelong destiny is to restore Tatlong Taong Walang Diyos. if you need any help, we are here to serve. That guy might be Jay Ilagan. My destiny? Almost had it done, but Japan Foundation turned down my proposal. Now they're doing a safety print, but red tape is causing delay. Yeah, that could be Jay in the picture. I thought the loveteams back then were Nora - Tirso, Vilma - Edgar, Hilda Koronel - Jay Ilagan. I thought Nora & Jay Ilagan didn't make a movie until much later. While Nora & Vilma were singing and dancing in their movies, Jay and Hilda were doing drama movies for Lino Brocka. Of course, Lino was just starting then. Three award-winning movies of the late filmmaker Lino Brocka and five films featuring superstar Nora Aunor were cited by activists in their list of the 10 best Filipino films of all time, with the much-heralded opus Maynila Sa Mga Kuko ng Liwanag (1976) emerging as the top choice. Sidney, you sent me a private message but never answered it. Can you read the message I sent you? What's your answer?